Reel Artsy: Before Tomorrow or was it yesterday? Before Tomorrow or was it yesterday? Before Tomorrow just had it’s theatrical release in Canada last night. 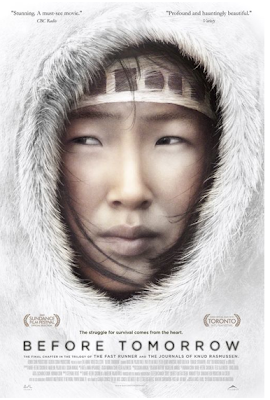 Just like the pace of the Inuit film, this film made a quiet statement, but a powerful one. The film is set in 1840 and shows how Inuit were living when the onslaught of white men were merely rumours told by few. We first see the reunion of two families during the summer when there is much happiness abound. Shortly after, the two main characters Ninguiq (Madelin Ivalu) and her grandson Maniq (Paul-Dylan Ivalu) head to an island to begin drying the fish and bring Ninquig’s best friend Kutuguk (Mary Qulitalik). The drama unfolds on the island and continues through the rest of the film as the two main characters face death, mortality and isolation. The immense power that is captured in the stillness and quietness of this film is intense. It won best Canadian feature at it’s world premier at 2008 TIFF, Best Feature film at 2008 imagineNATIVE Film + Media Arts Festival, Best Feature Film at 2008 Annual American Indian Film Festival and the 2009 Sundance best Dramatic World Cinema Competition. The film is from Arnait Video Productions collective, which is an Inuit women’s collective that takes Inuit women’s stories to produce culturally authentic and community-involved films. Based on the book Før Morgendagen by Danish author Jørn Riel it the film is used as a vehicle to empower Inuit peoples to tell their own stories in a new medium. Before Tomorrow's pace is one that is foreign to us now which is precisely the reason this film should be seen. It is a reminder of things past, of a life more simple and somehow more pure. Excellent poster art! The trailer almost has a 1st person video game feel to it, the pulsing beat gives it a real intensity. It's amazing how music can convey a mood. This sounds like a very interesting film and I agree with Karen, the poster art is great. Thanks for sharing this info! Interesting clip; it reminds me of "Nanook of the North". Why haven't I seen Nanook of the North already??? Unless I watched it in school and forgot. It's on my list. Nanook of the North is a quintessential film- I watched it as part of a Philosophy of Film class before. Must see (in a big screen preferably).